Our team provides cosmetic dentistry, implant dentistry, orthodontics, and many other services to help you attain the perfect smile you’ve always wanted. Your dental experience will be perfect, too, with comforts like our heated treatment chairs and complimentary beverage bar. To achieve your perfect smile, call 203-349-3537. 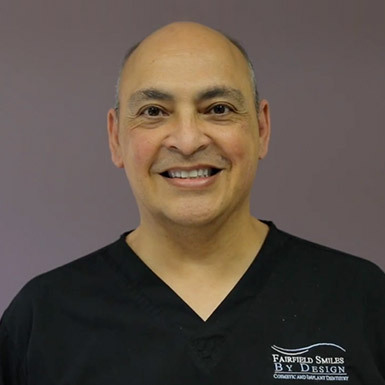 Dr. Cuevas has been committed to excellence in dentistry as a lecturer, tenure-track faculty member, researcher, and practitioner. After earning his DDS from the University of Iowa, he completed a postgraduate specialty training residency in prosthodontics and an American Cancer Society Fellowship in oncology and maxillofacial prosthetics. He has published research on dental implants and cosmetic dentistry. Use dental veneers, teeth whitening, and our other cosmetic treatments to change your smile from one you keep under wraps to one that earns second looks. Contact a member of our team to schedule a complimentary cosmetic dentistry consultation. You’ll get beautifully straight teeth with the orthodontic treatment method that best suits your smile. Call us today to discuss your options: Invisalign, our own orthodontic aligners, or clear ceramic braces. They’re all more discreet than metal braces! Our experienced implant dentist places and restores dental implants, so you won’t need to see an outside specialist for any part of your procedure. We offer many dental implant options; schedule a free consultation to find out more about all of them. Having a perfect smile isn’t an impossible dream. It’s actually a realistic goal – one the team at Fairfield Smiles is happy to help you achieve. Whether you need a simple dental cleaning or a full-mouth restoration with dental implants, we’ll use the latest technology and a gentle touch to complete your treatment. We offer multiple options for most types of treatment, so you’re sure to find one that’s right for your lifestyle and your budget. We take time to explain them all, so you can choose the solutions that are best for you. You can feel confident knowing your care is in the hands of a dentist who has served on the faculty of the University of Connecticut School of Dental Medicine. If that’s not enough to relax you, maybe our heated dental chairs will! They’re just one of the many ways we make you comfortable when you visit our Fairfield, CT dentist. If you’re a new patient, ask us about our complimentary consultations for dental implants and cosmetic services. To schedule, call 203-349-3537 today.